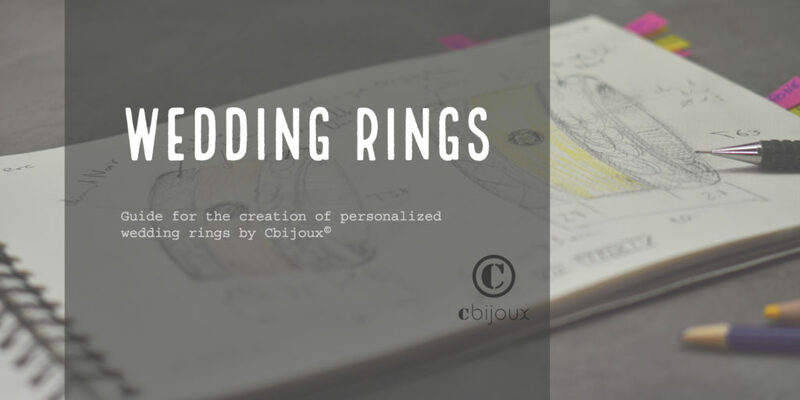 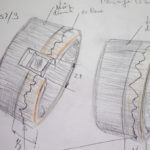 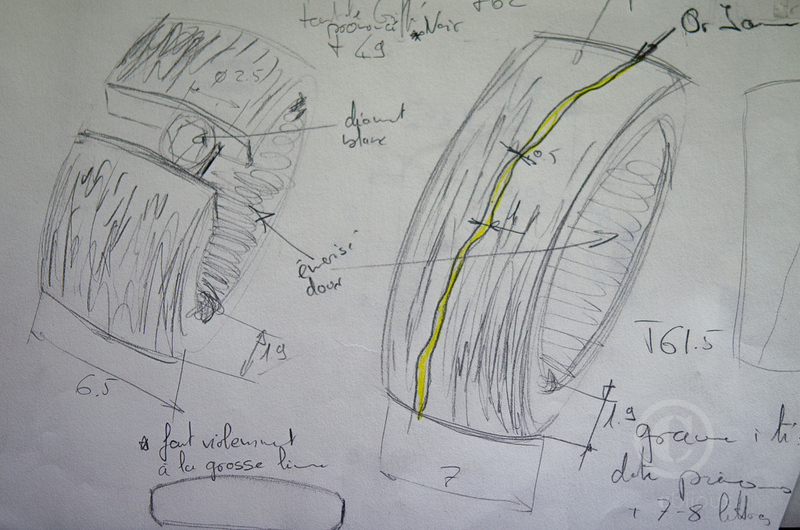 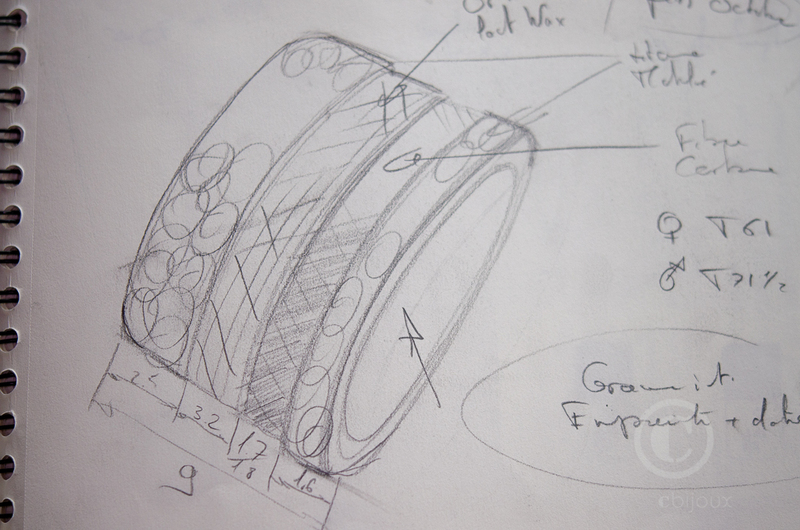 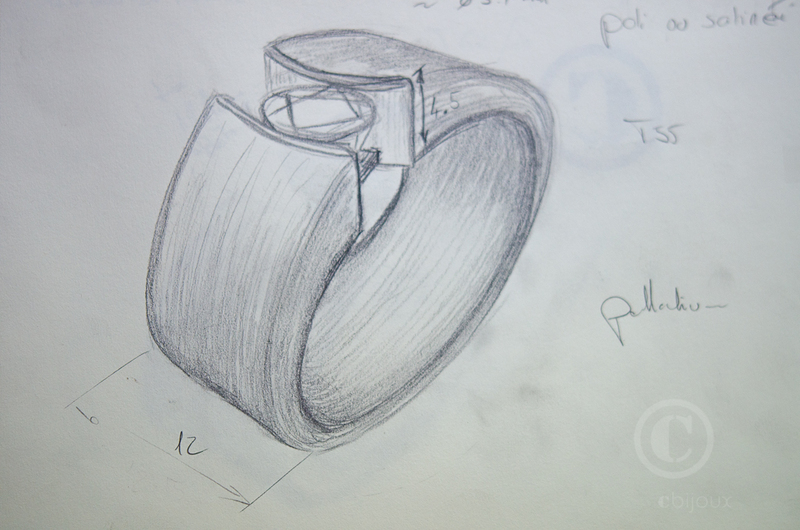 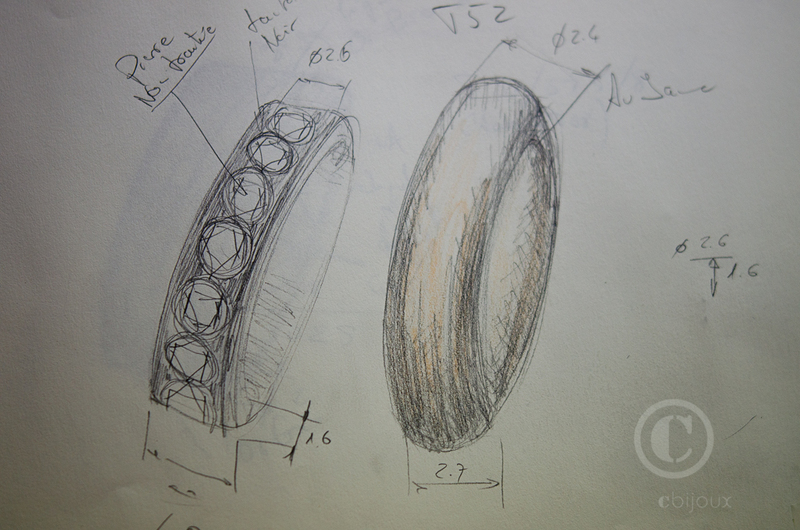 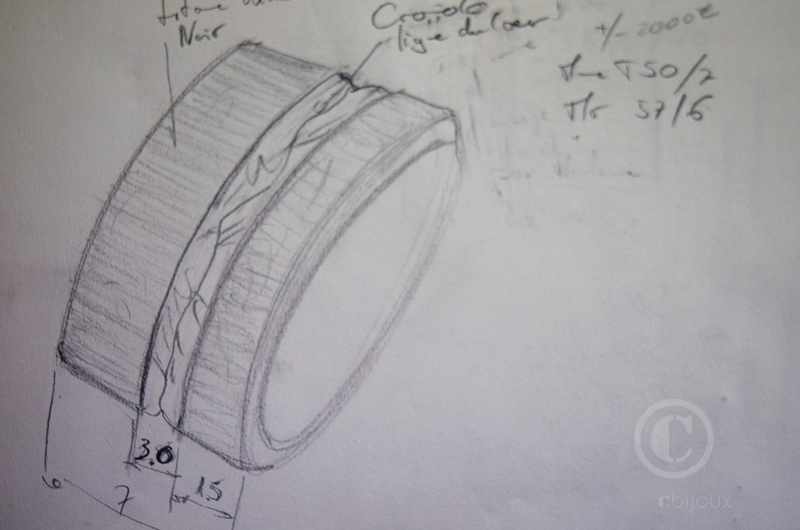 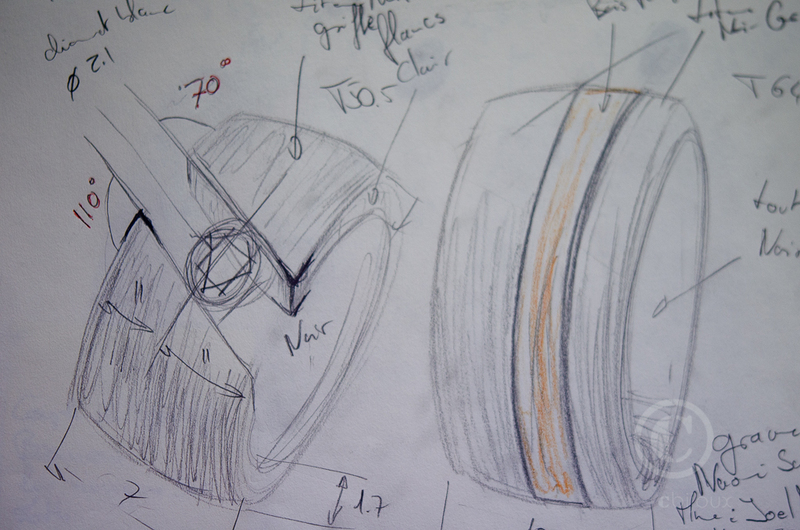 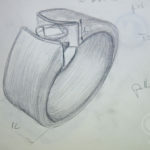 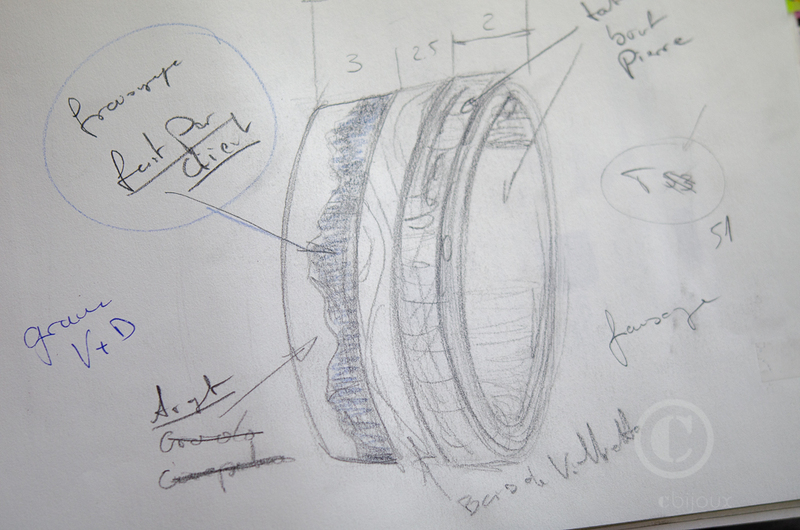 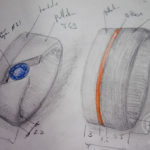 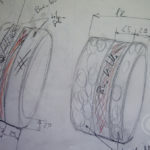 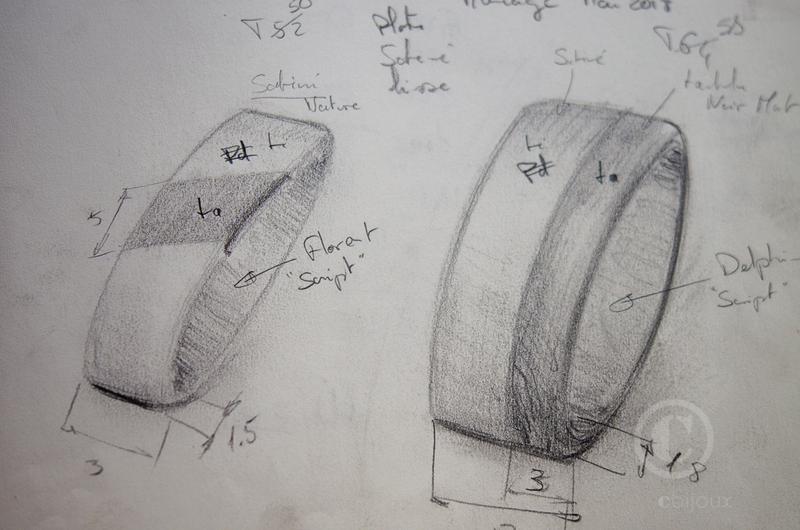 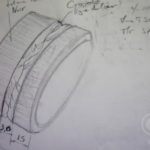 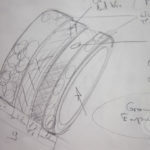 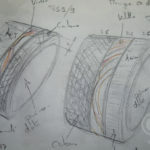 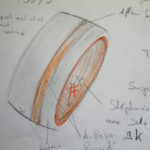 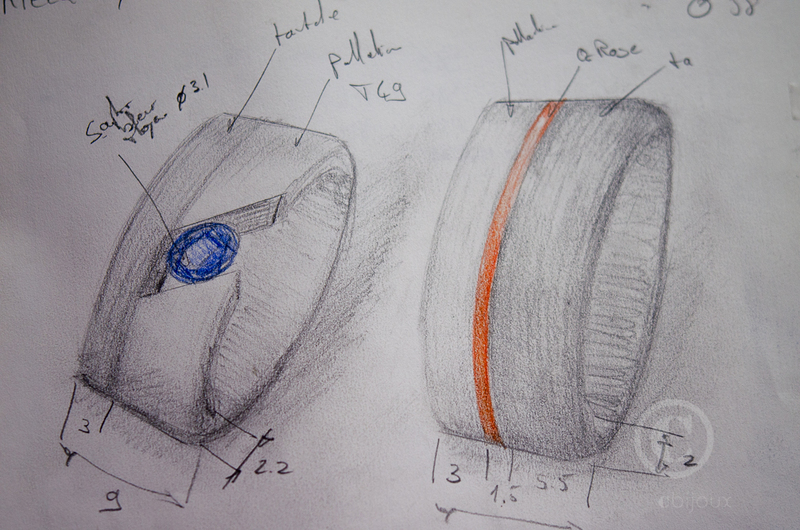 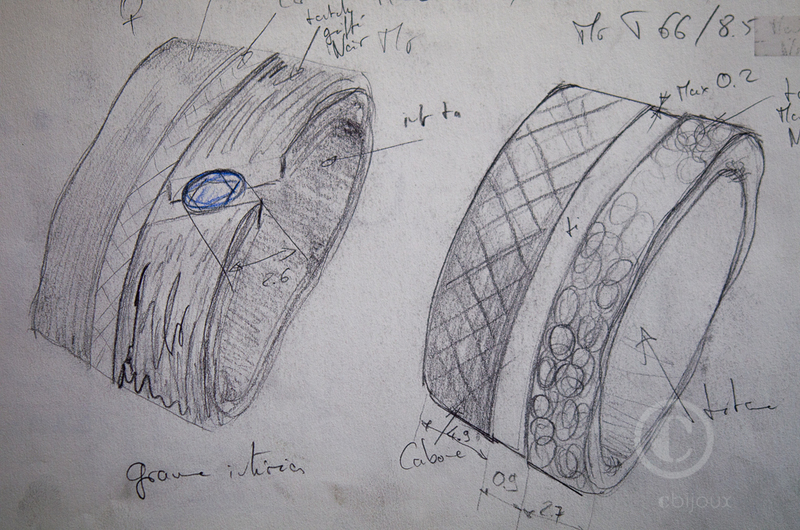 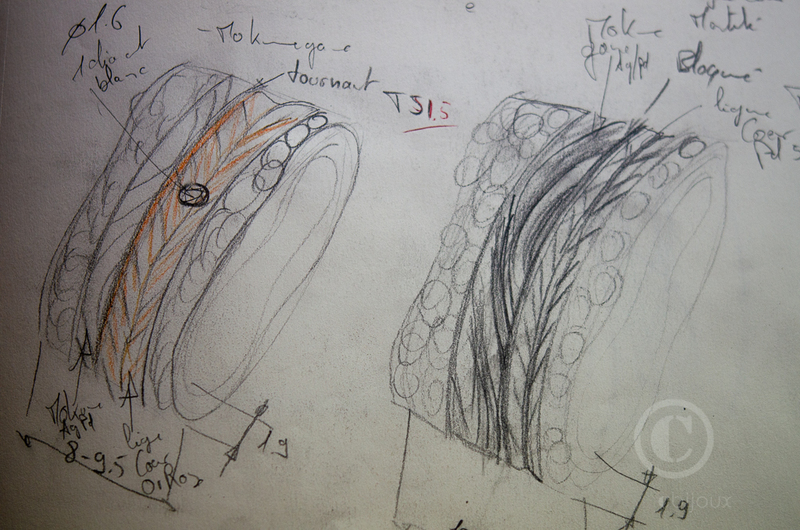 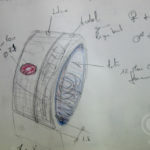 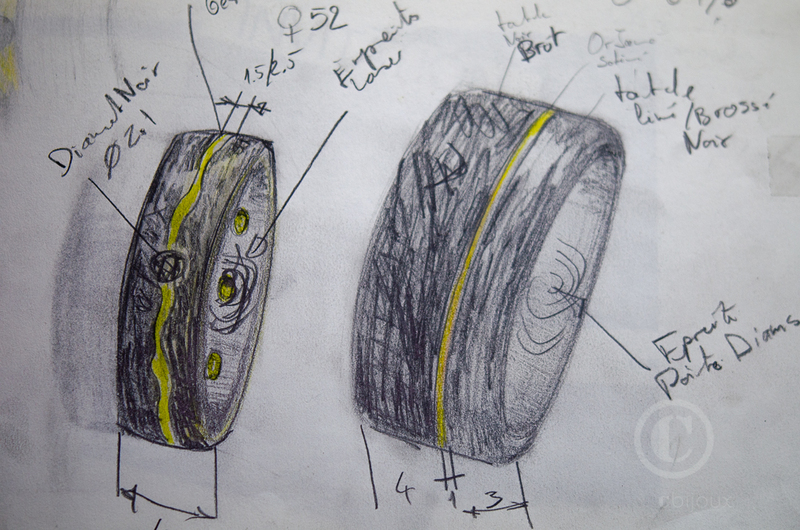 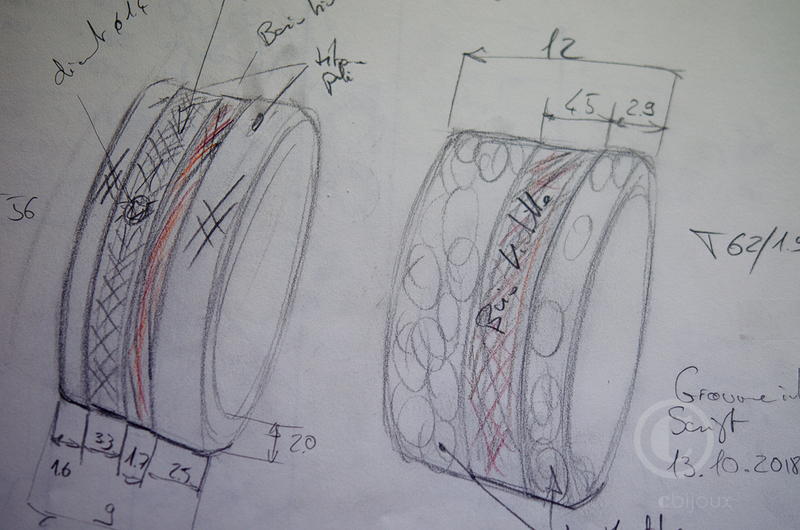 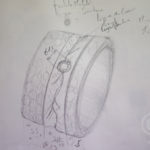 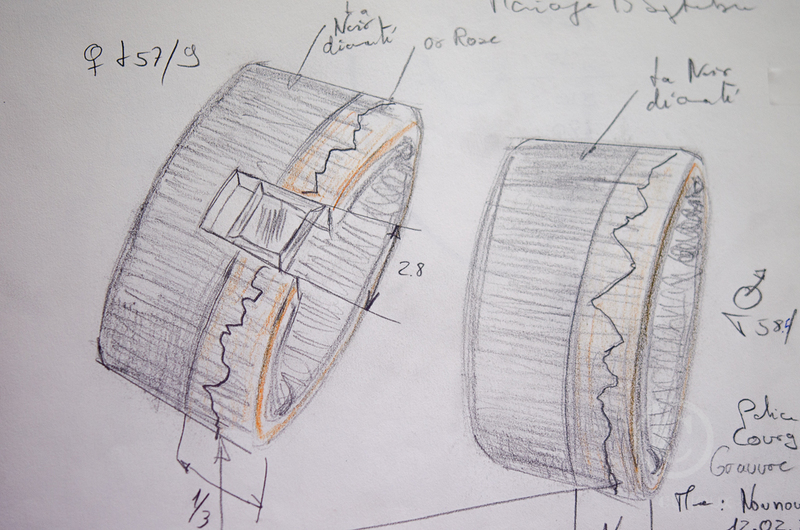 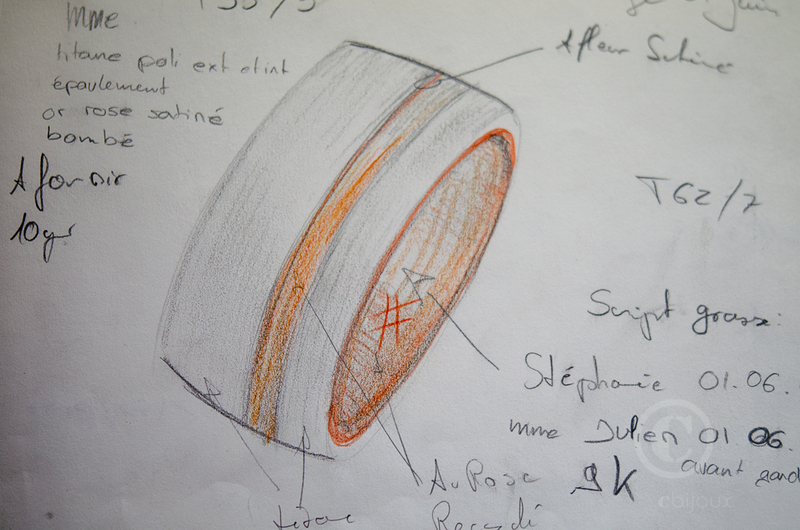 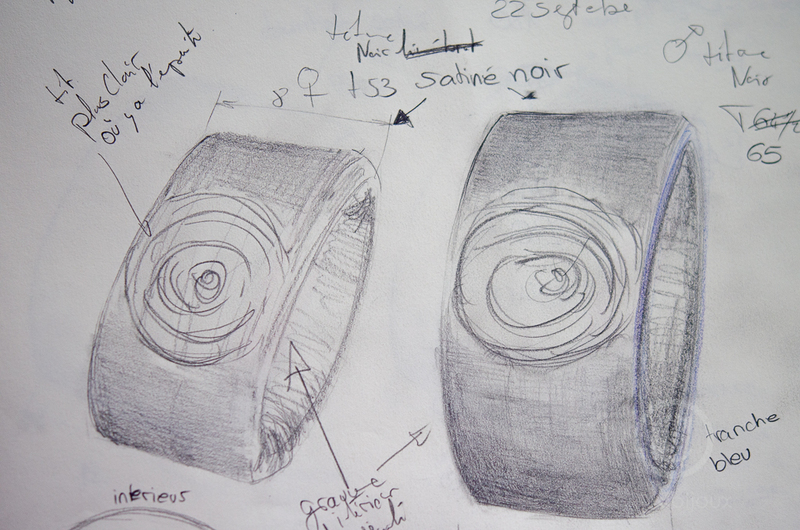 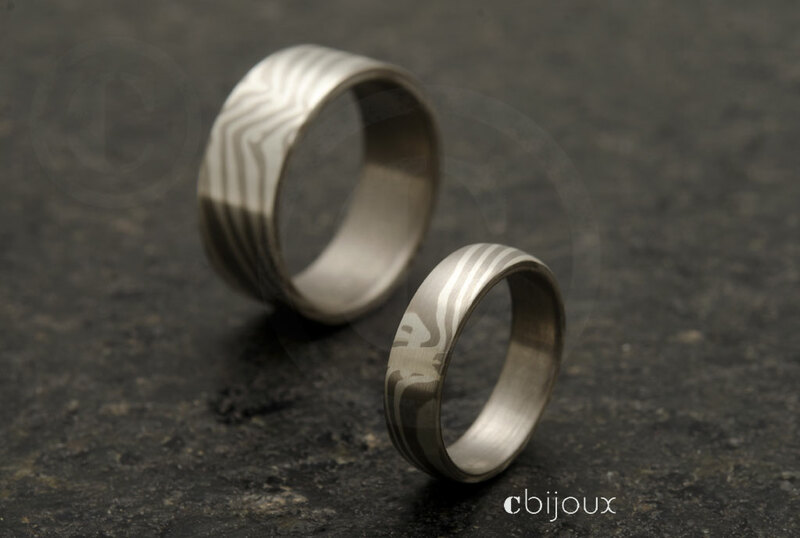 Guide for the creation of custom made wedding rings by Cbijoux©. 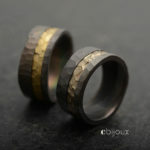 How does one choose among all the models of rings that are on cbijoux ? 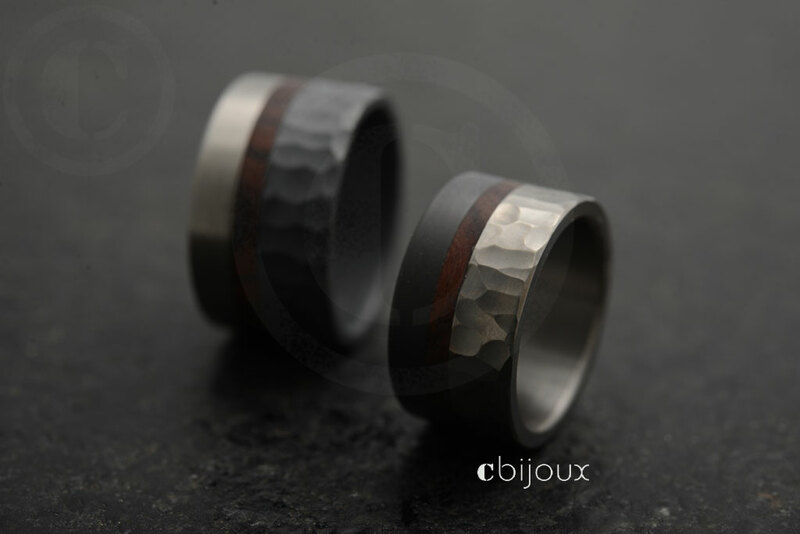 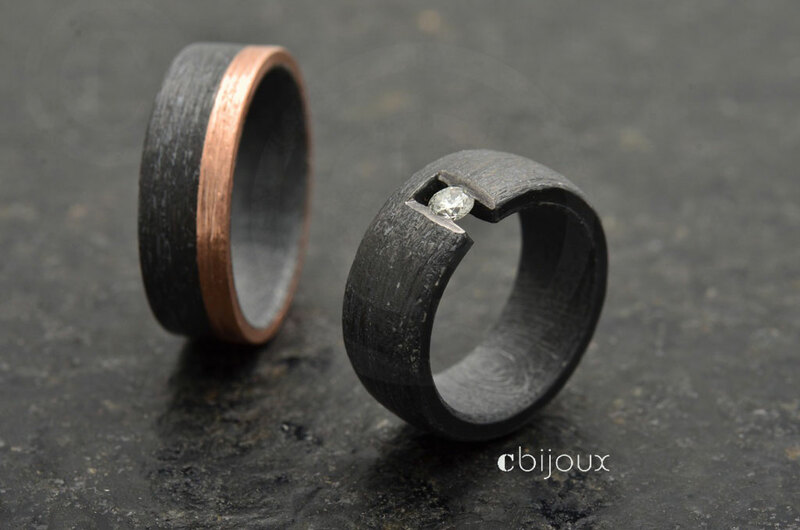 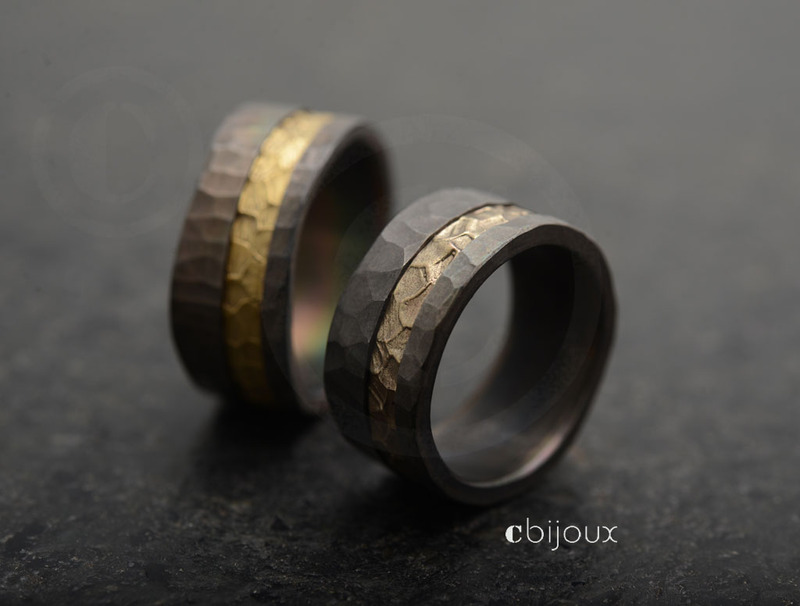 The examples you can find on cbijoux.com or on different social media such as Facebook or Instagram, are models published to inspire your pair of engagement or wedding rings. 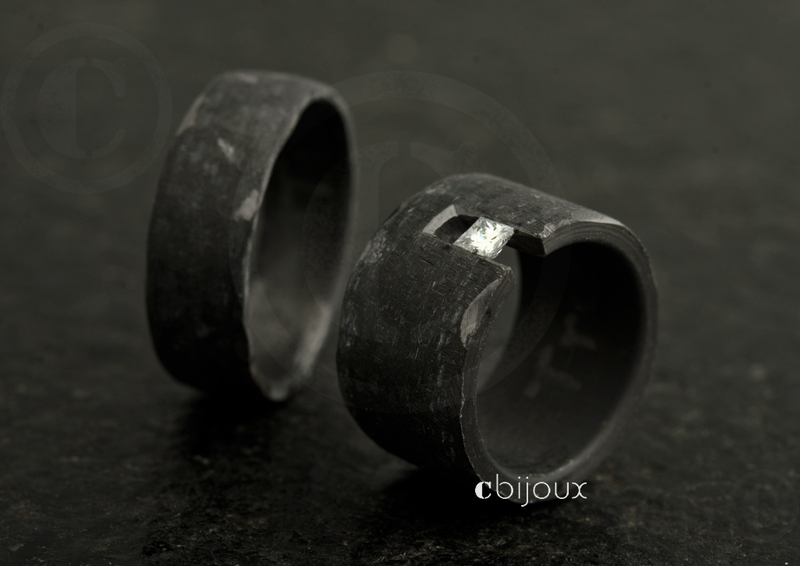 They are not pieces to be duplicated. 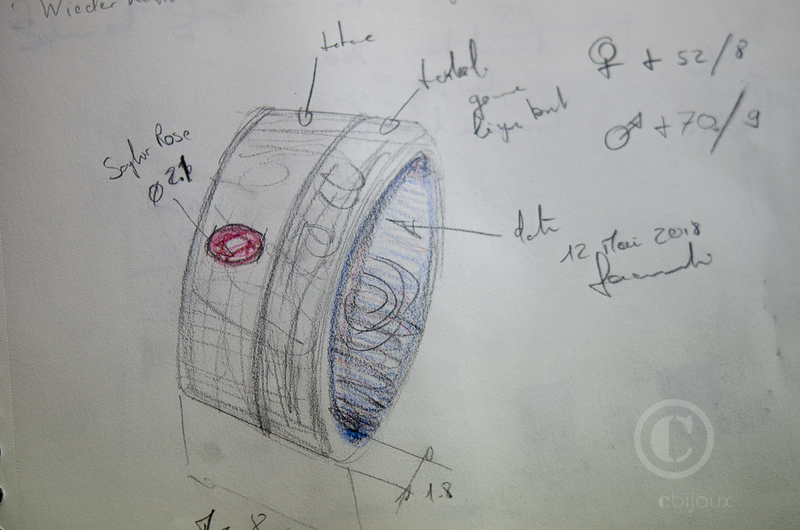 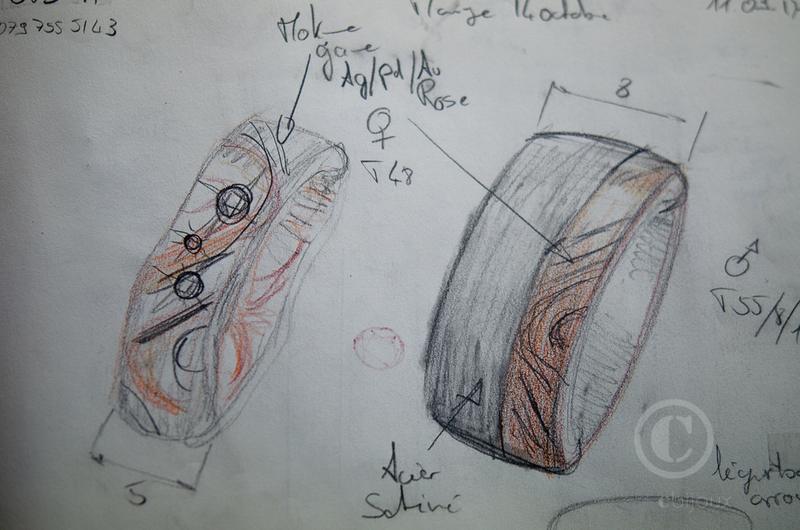 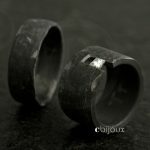 They are to be taken as inspiration in order to create a new unique piece, for you, based on the different elements that have seduced you, such as profile (the ring’s shape : D-shaped, flat, slightly rounded…), material/s, finishes, structures, stones, engravings…. 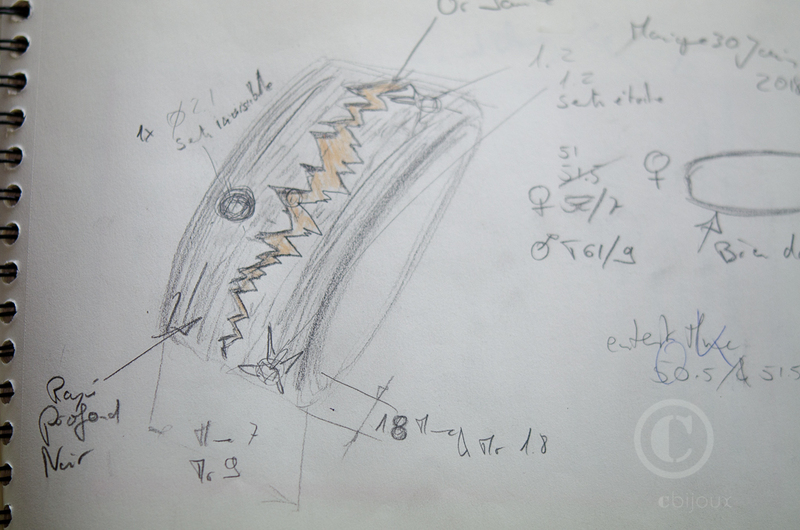 No panic, we will go step by step. 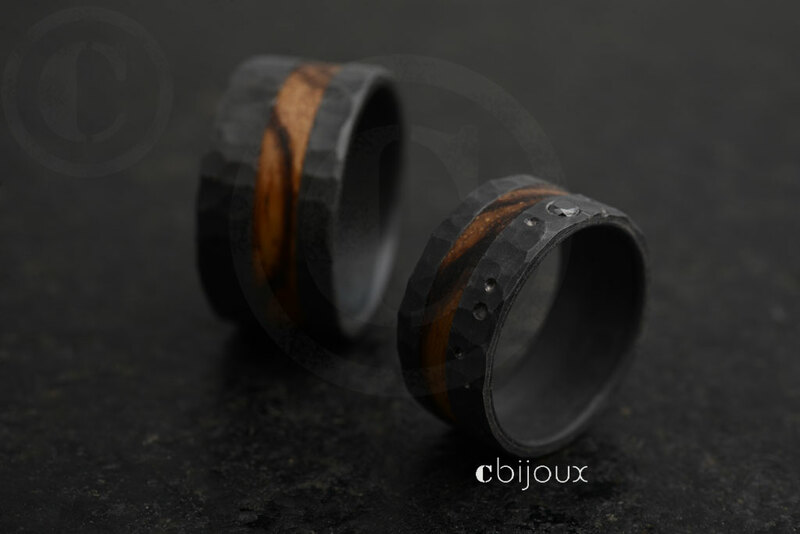 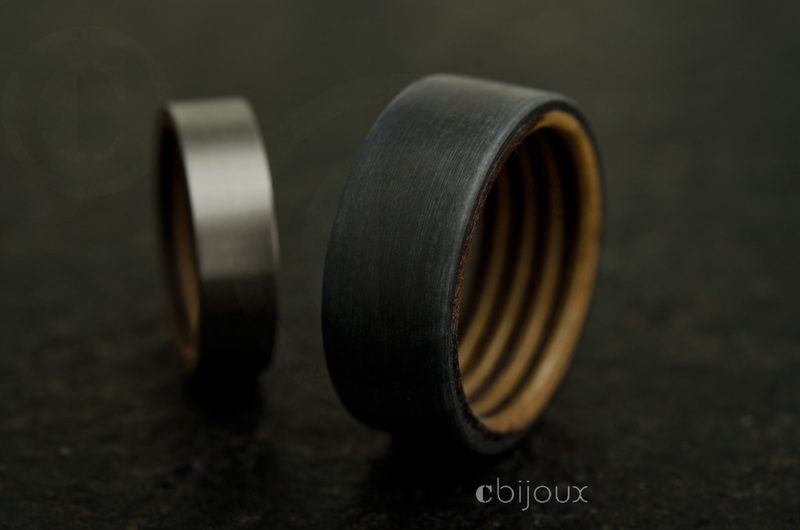 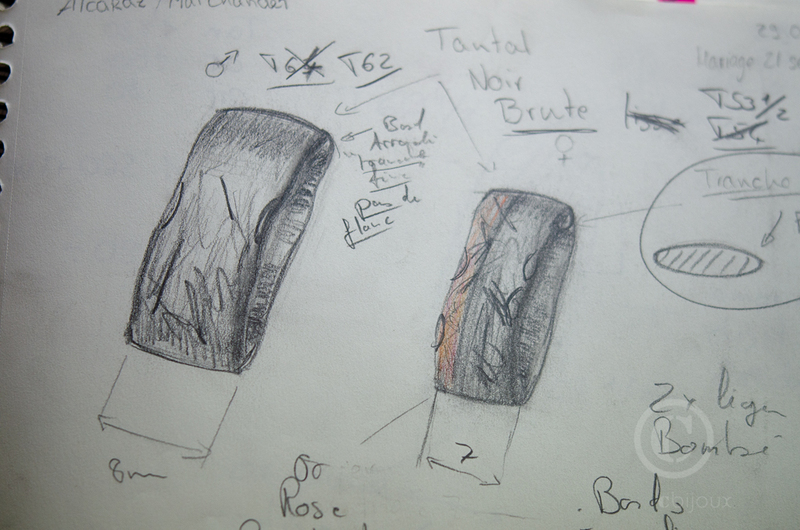 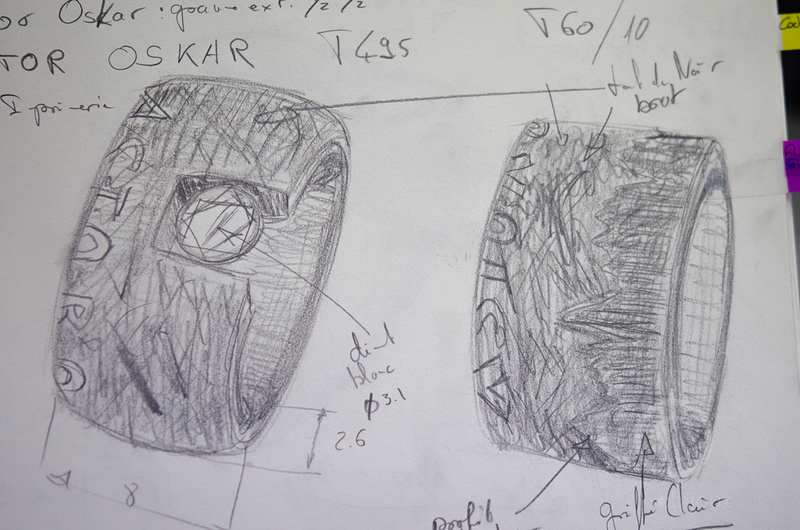 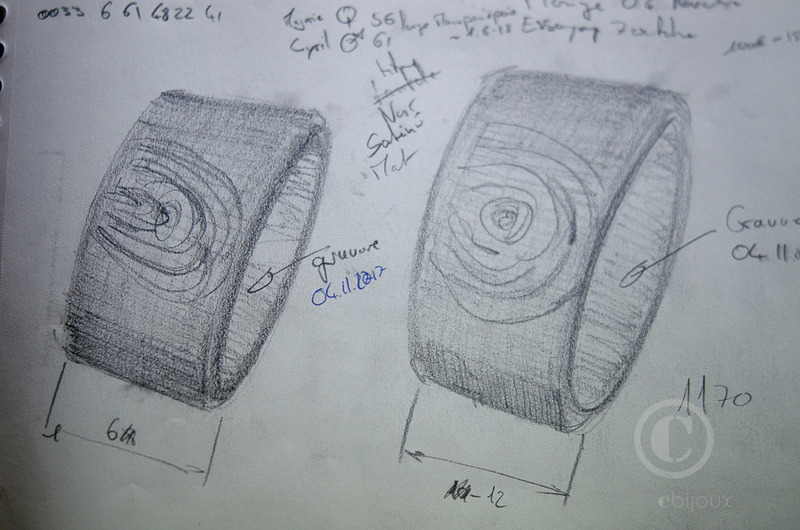 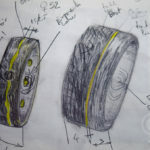 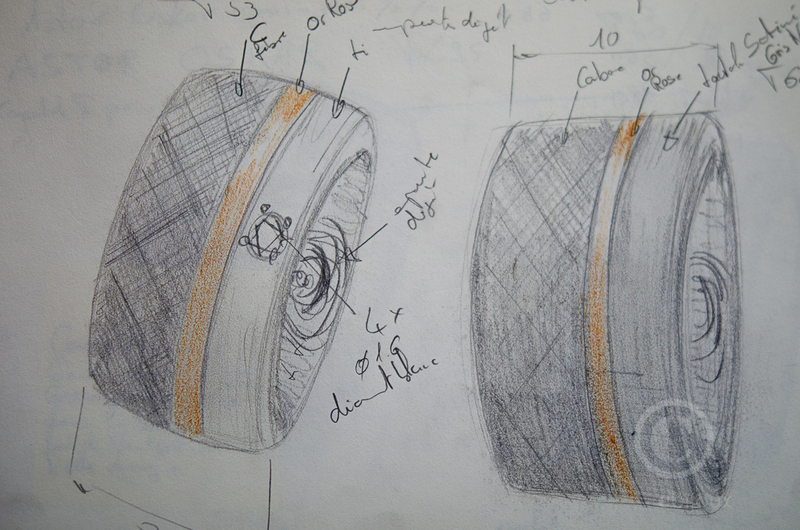 If you are looking into the creation of a ring with wood, click here. 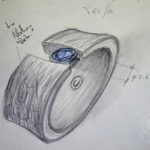 If you are looking for an engagement ring, click here. 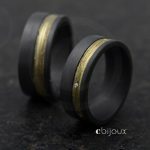 What are the prices for a pair of wedding rings made-to-order ? 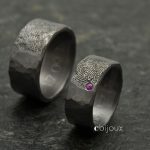 Generally, prices of our creations are not shown because they are all unique pieces made-to-order. 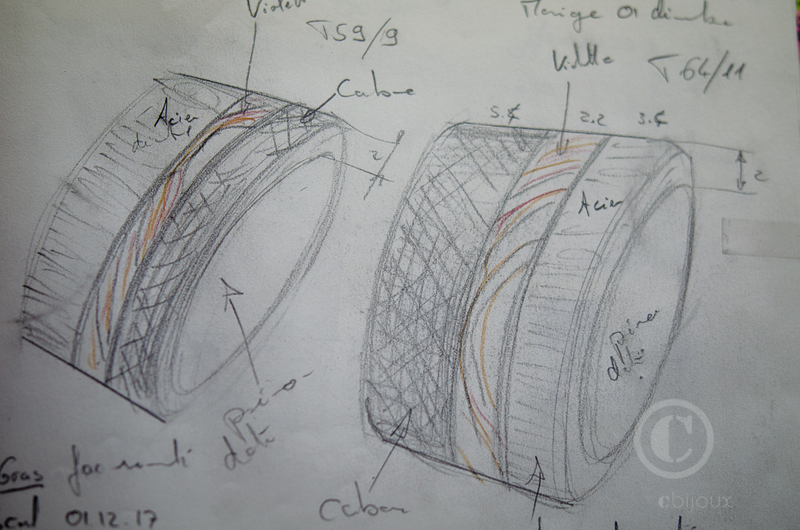 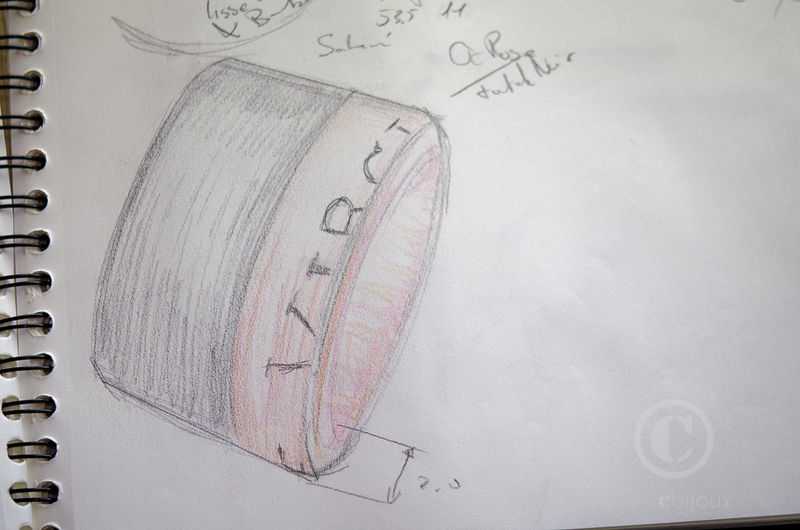 We can work on a project for you according to the different wishes you will formulate as you discover oury creations. 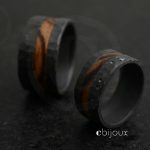 To better illustrate your wishes, you can also choose different creations that speak to you by browsing cbijoux.com and sending us the links during our e-mail exchanges. 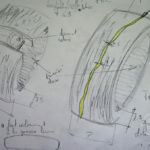 Show us the criteria you are looking for, this way it will be easier for us to gain a full understanding of your expectations. 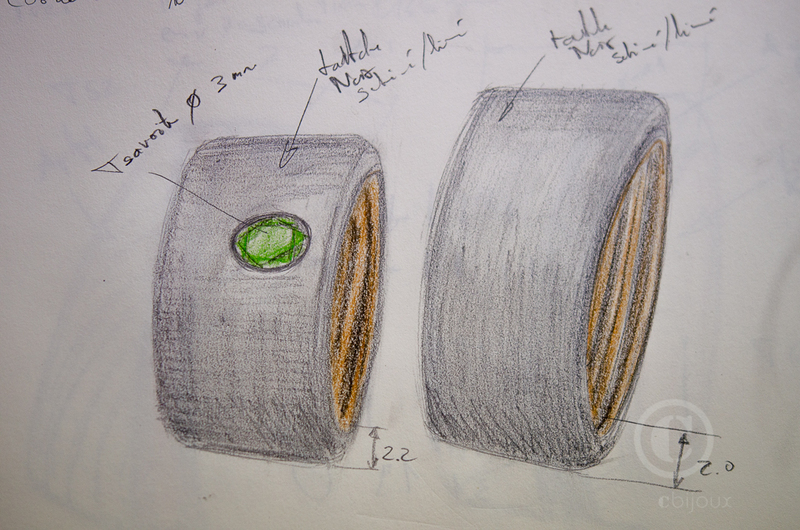 Can we simply come to the Monthey showroom ? 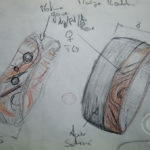 Before making an appointment, I ask you to have a good knowledge of our way of working and of what kind of creation you would like. 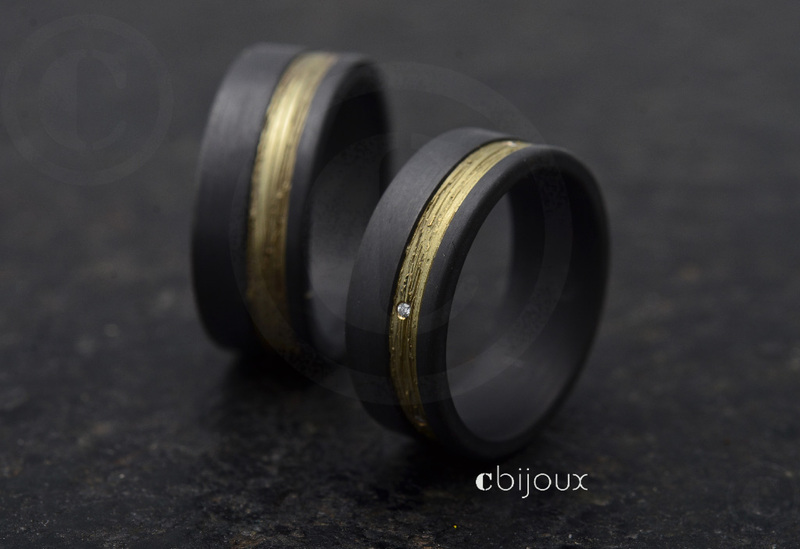 This way, we can create your unique and ideal rings. 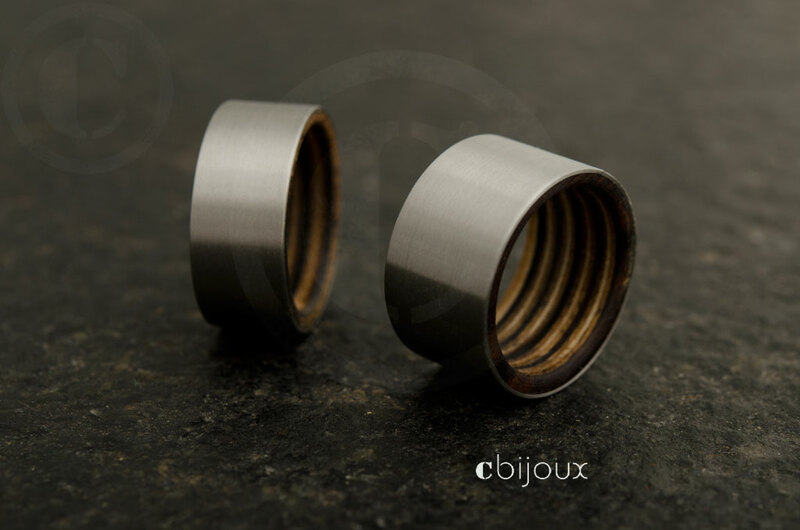 As our way of working differs greatly from the rest of this world, it requires a good knowledge of our offer, our style of creation, materials such as tantalum, different types of finishes, etc. 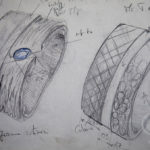 Browse the news to gain a better understanding of these different elements and to learn more about contemporary jewellery. 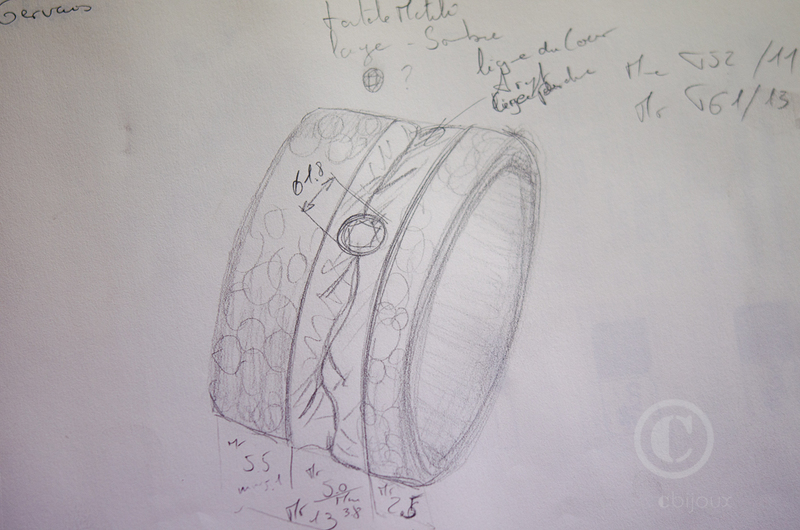 We will discuss all details – size, width, materials, profile, etc.. – during our appointment. 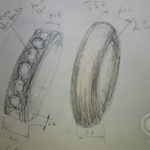 We will draw you a sketch and make an offer then. 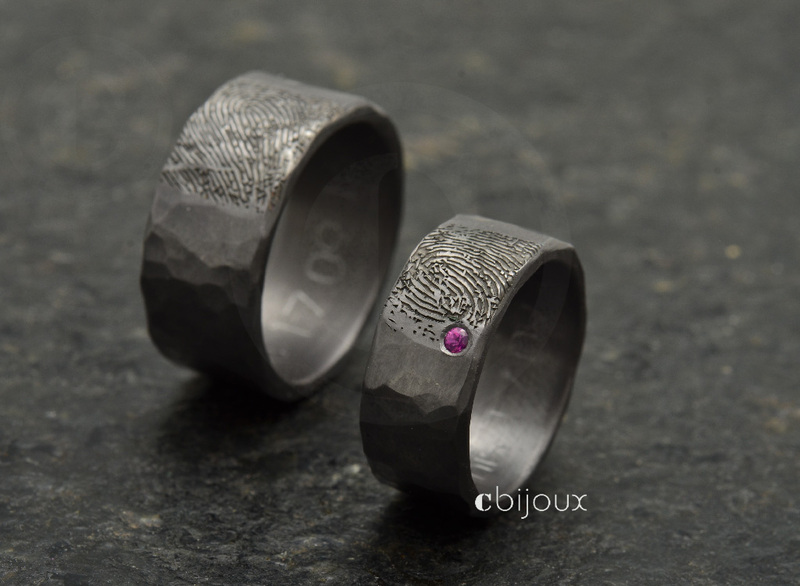 Can we order personalized wedding rings by mail order ? 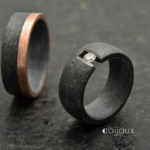 Yes, you can, for sure ! 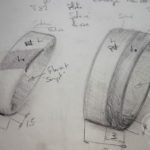 Here is how the organization works when it comes to orders by mail. 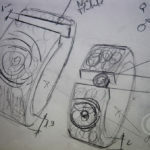 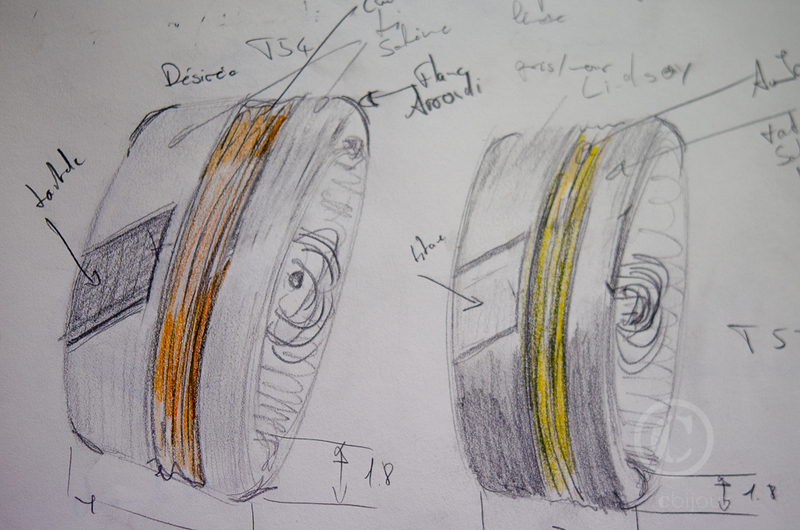 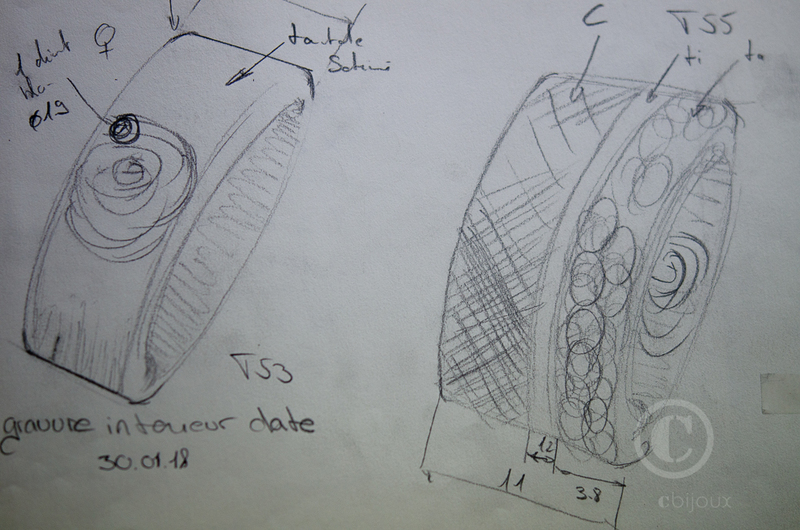 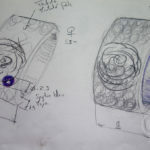 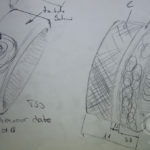 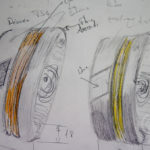 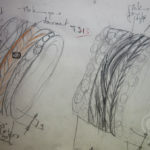 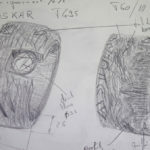 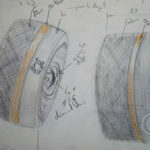 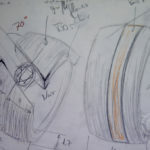 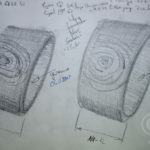 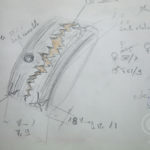 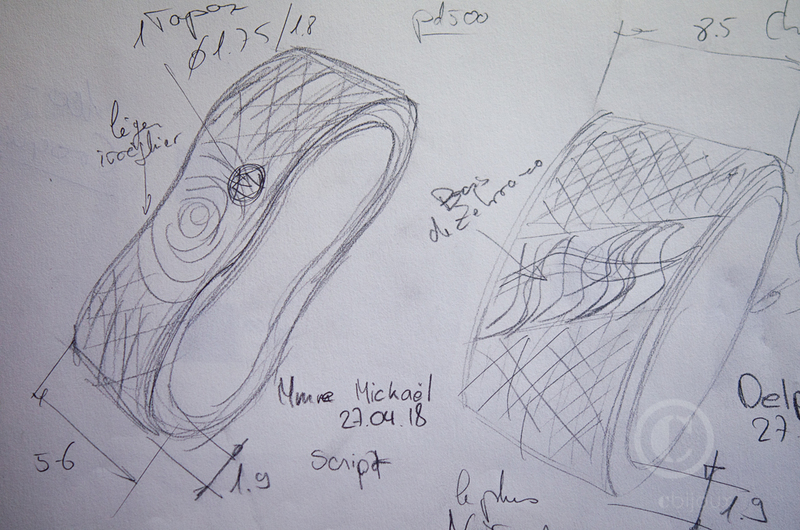 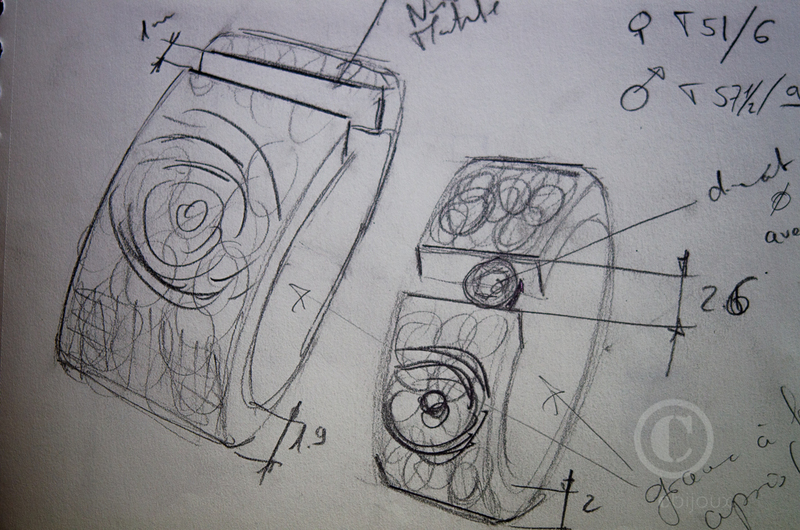 When you have decided on the criteria you want for your unique creation (size, width, material, aspect…), that we have put them together by means of a sketch, you will confirm the order by paying half the total amount and we will then set a deadline. 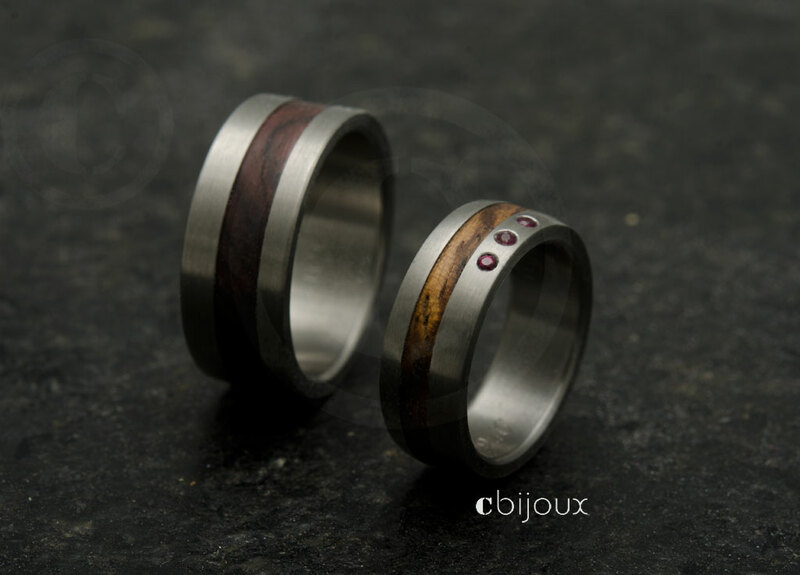 You will pay the full balance upon receipt of photos of your wedding rings and finally your order will be shipped. 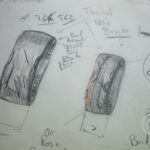 A small difficulty very important to consider is that (unfortunately), we will not be able to measure your finger sizes ourself ! 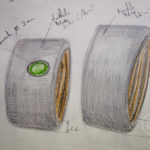 It is up to you to obtain them, you will have to go and measure them yourself at a jeweller or a department store and ask them to provide you with this service by offering to compensate them. 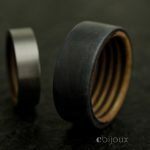 Be sure to test a ring of the same width as the ring you wish to order, as a thin ring feels much looser than a wide one. 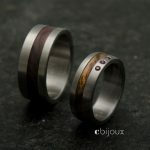 The latter must often be taken one to two sizes larger than the measurement of a thin ring. 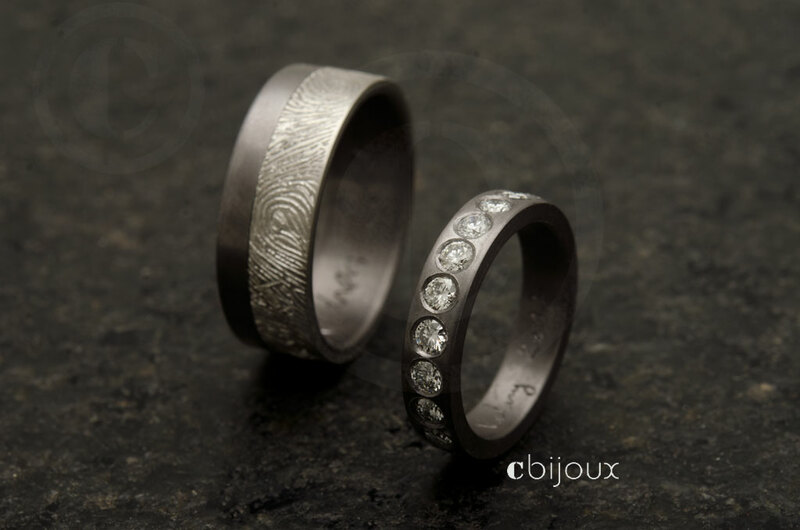 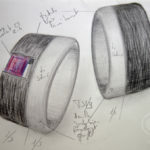 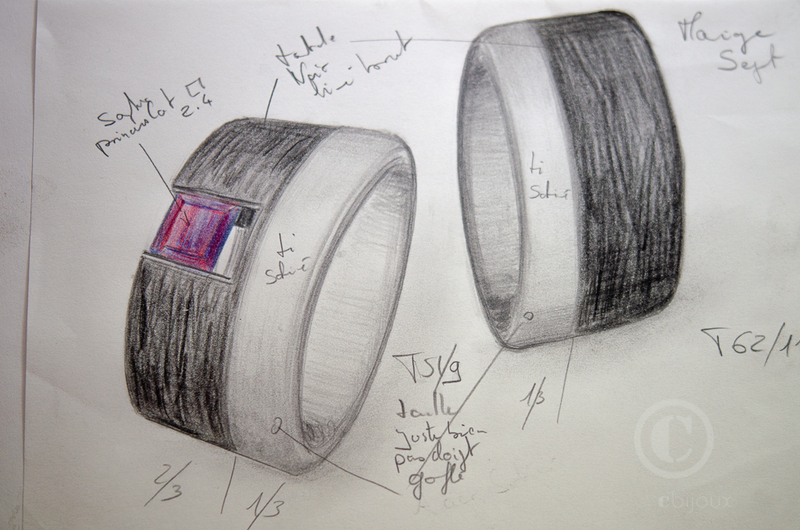 Who creates the Cbijoux wedding rings ? 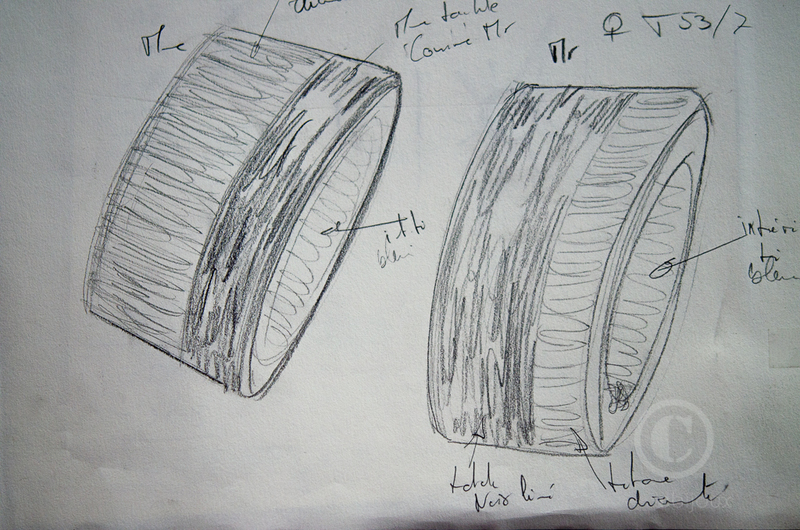 Your servant, Cédric Chevalley (the guy in the picture below, the one with the cap, not the hairy one!). 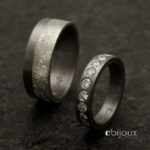 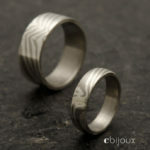 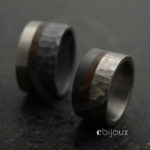 I sign my creations of wedding rings “cbijoux” since 2001. 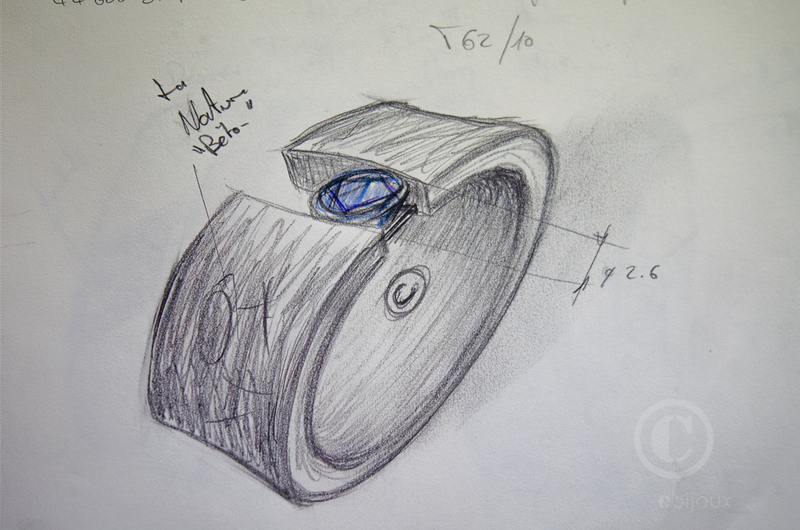 I have created the mood collection ring in 2004 and passed on this brand to two friends in 2013. 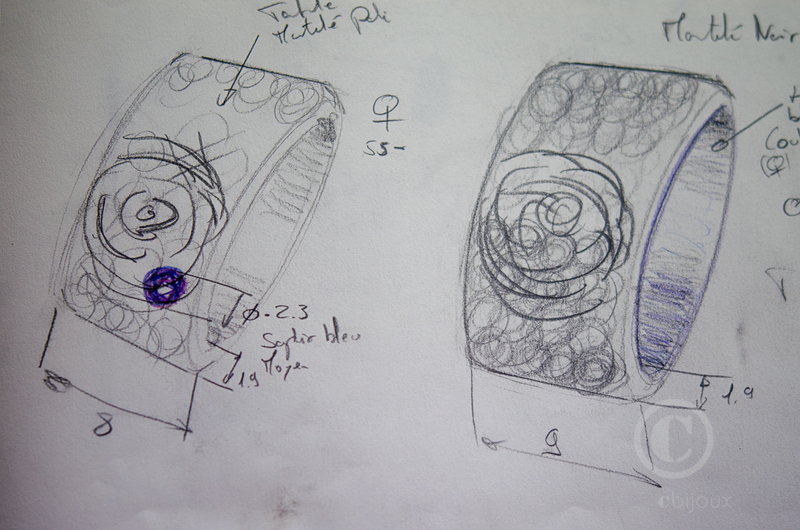 Then, I have also created the brand Diirt upcycling. 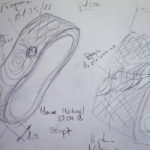 You can find out more about my journey and my story by scrolling down my Facebook page (feel free to like it) and also on my website here. 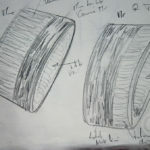 There, I hope I have answered all your questions and have enabled you to go forward in the realization of your dream creation. 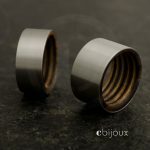 I stay at your disposal for any other question. 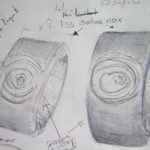 If you have enjoyed this article, that it helped you see more clearly, share and like it, it would make me very happy! 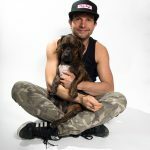 Let’s stay in contact on Facebook and Instagram! 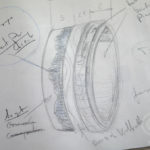 You can also learn more about the different criteria to be defined by reading my little PDF guide “Guide to create your contemporary jewel”. 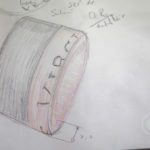 Send me your requests by clicking here.